Rosie was rescued by our clinic in May 2018. She was badly burned on her back. The video shows her back healing after a month and a half of laser treatments. After spinal surgery for ruptured disks in Oct 2018, Sandy could not walk. 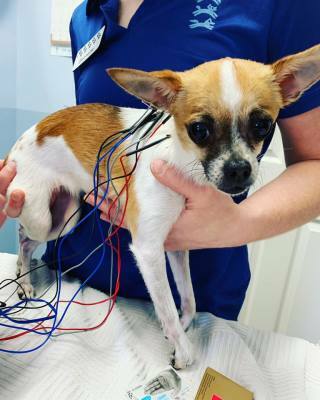 She came to VCRC in Nov 2018 and this video shows her progress after electro acupuncture and laser therapy. Sage was diagnosed with Degenerative Myelopathy. The video shows Sage before treatment and after a week with one electro-acupuncture treatment. 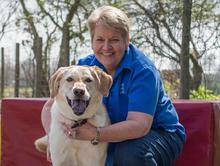 Drew was rescued from a shelter by Golden Beginnings Golden Retriever rescue as a puppy. He had been infected by neospora caninum, before he was even born and due to the infection affecting his spinal cord he was unable to walk. Golden Beginnings started bringing Drew to VCRC for rehabilitation therapies and he was fostered by Dr. Robinett and Jerri O'Donohoe who had the privilege of adopting him after investing so much time and energy into helping Drew learn how to walk. Now Drew inspires other patients who can not walk to not give up hope. It is very rare for a puppy affected with neospora to be able to walk, and Drew can not only walk he can run, play and even go up and down stairs! Lola went completely paralyzed on Dec 8, 2018. After just four Acupuncture and Aqua Therapy treatments with Dr Costin, she is walking on her own and hasn't needed any surgical interventions.